Is it necessary to soundproof vinyl flooring? Vinyl floors are becoming increasingly popular in the flooring market. Inspired by floating floors, planks or vinyl tiles offer many benefits. However, some popular beliefs, including their acoustic properties, are questioned. Before choosing this choice of flooring, learn more by reading our article. After a difficult start, the product is now in focus but we still find low-end products that we simply advise to avoid, because the thickness is often 2.5mm. A thin vinyl is more at risk of indentation than a thicker vinyl. That is, it is less resistant to marks and scuffs of furniture legs and appliances. Also, it is more likely to be delaminated, so that its wear surface is detached from the rest of the product. In most cases, it is wrong to believe that a vinyl floor installed alone offers acoustic properties. However, there are effective acoustic solutions on the market to soundproof this type of floor covering. However, some limitations must be respected. The installation can be floated ("click" system) directly on the substrate with our AcoustiTECH LV membrane. 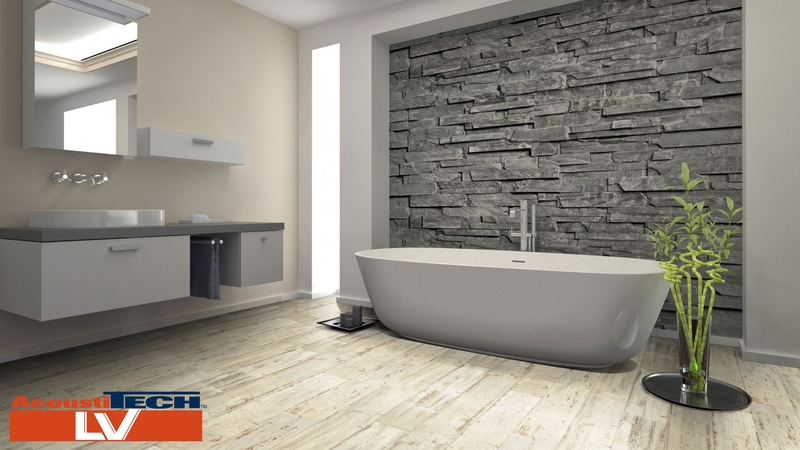 In this case, the total thickness of planks or tiles must be at least 4mm. The installation can also be glued with the same AcoustiTECH LV membrane. The total thickness in this case must be at least 3.2mm with beveled joints. Use only an adhesive specifically designed for vinyl planks and tiles and recommended by the flooring’s manufacturer and the acoustic membrane’s manufacturer. This type of installation is more resistant to lateral displacement and the presence of water because the adhesive acts as a sealant at the joints. Any acoustic membrane installed under any floor covering type creates vertical movement. An acoustic membrane does not prevent the floor from contracting or expanding due to changes in temperature and humidity, even for a vinyl flooring (planks and tiles). An evaluation of a sample of your vinyl flooring can be done at our laboratories (even for vinyl with a total thickness of less than 3.2mm) to test compatibility with our AcoustiTECH LV membrane. In short, if you opt for a vinyl flooring (planks and tiles), consider integrating an acoustic solution designed specifically for this type of floor covering. Finally, choose a high-quality vinyl, with a thickness greater than 3.2mm. Good renovation project!